Chicken tacos are a favorite in my house and I am constantly looking for way to reinvent this traditional Mexican dish. When preparing chicken tacos, I often turn to my slow cooker for help. Not only does it make cooking dinner easy but it ensures that the meat will be juicy and flavorful since all the ingredients have had plenty of time to marinate and develop. Better yet, dinner is practically ready when you are. Chicken enchilada tacos is a great meal for a crowd because you can make a large portion at once. The chicken, enchilada sauce, and beer are placed in a slow cooker and left for at least six hours for all the flavors to get to know each other. Serve these tacos with your favorite toppings including guacamole, queso fresco and freshly chopped cilantro. 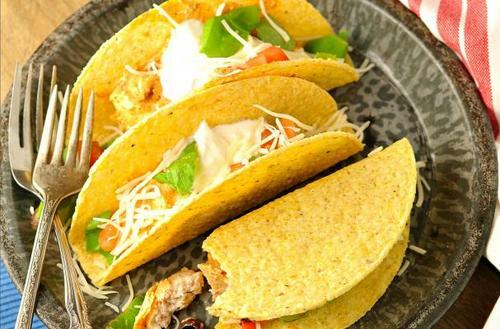 Before you consider pulling into the nearest drive thru, consider making these cheesy chicken tacos instead. Chicken breasts are cooked in a crockpot with cream cheese and taco seasoning which not only imparts flavor but creates a rich sauce to go along with it. I prefer using a hard taco shell with this particular recipe because the sauce slightly softens the shell. If you are into fusion meals, then this recipe is for you. Chicken breasts are simmered for hours with onions, peppers, and a variety of spices. After cooking for three hours in the crock pot, all the flavors meld and become something delicious. The chicken taco filling is served in corn tortillas and melted mozzarella cheese. 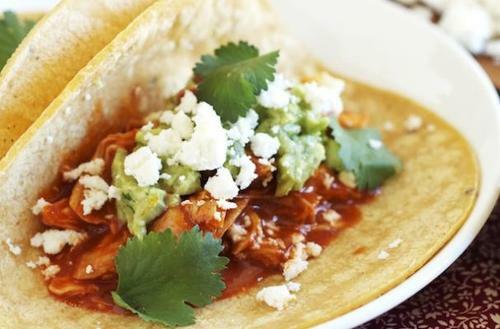 This chicken taco recipe is made in the slow cooker without much effort on your part. Chicken breasts are combined with your favorite jarred salsa, taco seasoning, and Mexican beer before cooking low and slow in the crock pot. 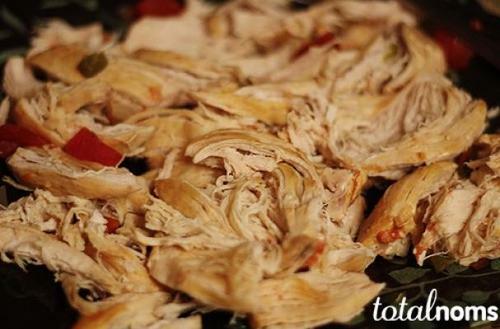 You can enjoy the shredded chicken in soft or hard tortilla shells with your favorite toppings. 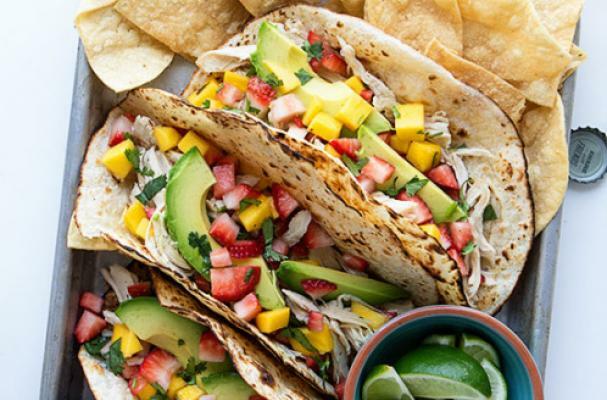 Tropical chicken tacos are a fresh spin on this Mexican classic. Slowly cooker chicken is piled into a flour tortilla and loaded with avocado, mango and strawberry salsa, cilantro and more. One bite and you will be hooked on this light meal.